US businessman Todd Warnock insisted the legal winter shooting of dozens of teal and wigeon – protected in the Dornoch Firth and Loch Fleet Special Protection Area – by the local landowner would cease if the 18-hole course at Coul Links went ahead. An environmental statement in the plans, produced by Alba Ecology ltd, also stated that the move would stop other birds expending their energy by flying elsewhere to rest and feed due to the loud gunshots. Mr Warnock said: “We are basically creating a bird sanctuary there and would have expected the RSPB to be supportive of that. The RSPB runs a national campaign against the illegal shooting or birds, but this does not cover teal and wigeon. Kate Bellew, senior conservation planner for RSPB Scotland, responded that Coul Links was part of a globally important wildlife site supporting over 20,000 wintering birds. She added that most of the area was inaccessible in the winter due to flooding, minimising disturbance from such activities as dog walking. But the developers maintain they would close the proposed 56-acre golf course during the winter months when these birds were in the region. And their design team has moved the course away from a dune slack habitat used by breeding birds. The developers contend the RSPB is sticking to a narrative that building a golf course will lead to habitat loss, which ignores their strategies for protecting birds and invasive species site management. 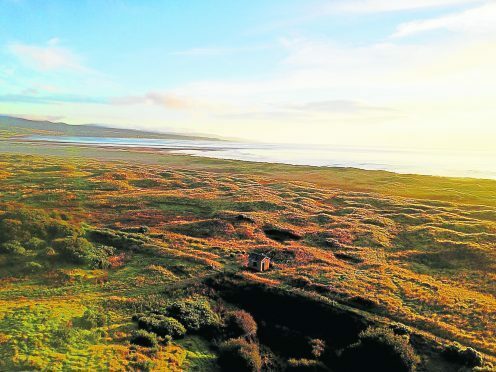 The environmental statement says there has been a 4.5-acre expansion of invasive bracken at Coul Links since 1988 – a 100% increase.